Make it, Bake it, Grow it. Thirty five years ago, The Channon Craft Market Inc. was born into The Channon village, near Lismore NSW on the North coast of Australia. It’s strongly held ethic of “Make It, Bake It, Grow It” flourished and this is still nurtured by the market today. Since our renowned market’s beginnings in The Channon Hall in 1976, it quickly outgrew that location and moved to its present location at Coronation Park. The Market was originally set up to trade and barter goods between members of the community and its creation also provided a meeting place for like-minded people explore current environmental issues. The Channon Craft Market has grown enormously in size and reputation since then. The Market has evolved during the last 35 years to become a Non-Profit Community Organization with a Management Committee of nine volunteers. They meet regularly to manage the diverse needs of our popular market, representing stockholders, The Channon and surrounding local community, and staff. The Management Committee employs approximately 18 staff members to supervise and co-ordinate the smooth running of the market each month. Held on the second Sunday of the month, preparation for Market day begins well in advance. The market office is the nerve-centre for staff co-ordination and stallholder placements. It also handles the many inquiries about the The Channon Craft Market, and attends to the various tasks involved in playing host to such a big event each month. On the Saturday, before the coming day’s influx of people, it’s an early start for the local crew who do the road taping and ground preparation. Come Sunday market day, the Market Managers and their staff are up and on duty by 5am. Stallholders, both permanent and casual start to arrive at 6am, their interesting wares, display tables and racks, poles and tarps in tow. At 7am casual stallholders gather ‘round to be given a spot on the grounds to trade for the day. Staff then assist stallholders in getting settled in time for early bird market goers who start trickling in from 8am to catch a bargain and fresh produce. The scene is set - serene Coronation Park seems magically transformed overnight into a festival of color. Every month, on rotation, a local community charity has the opportunity to fundraise at The Channon Craft Market with the use of the kitchen at Coronation Park. This modern facility was built by the community and provides a vital means to assist these valuable organizations in their local endeavors. The Market also supports local organizations/charities where it can with financial contributions towards equipment, stationary and administration time when available. The Channon Craft Market brings investment and employment to The Channon village, Lismore and surrounding areas. It enables over 250 stallholders to trade each month in a wide variety of goods which include art, craft, second hand, children’s activities, fresh produce and therapeutic goods and services. Commitment to Coronation Park has continued throughout the Channon Craft Market’s long history with the upgrading of many projects within the park. In the past 7 years the Market has contributed to the design and construction of the building of the Shed, upgrading of toilet facilities, upgrading and bitumening pathways and in designing the playground facilities. These projects have all had either in-kind and/or financial support from the Market management and staff as it endeavors to support local community organizations with such contributions. The Channon Craft Market is also sought after for its expertise in policy and procedure for running markets and the co-ordination of other events throughout Australia. The Market body actively networks with and works alongside the various government bodies to ensure that all the legal aspects involved in the production of a market of this size are covered. Coronation Park is an ideal location for The Channon Craft Market, with thousands of visitors entering the village for the day. Tourist buses come, bringing people from interstate and from overseas to experience this “must do” event while on their Northern Rivers visit. Market-goers are entertained with a music act which performs from a marquee on the oval. 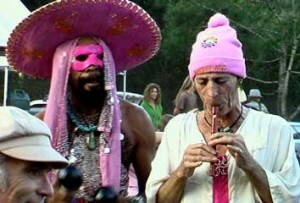 As people make their way around the perimeter stalls they are destined to come across an interesting busking act or two. Chairs and tables among the shade of the established trees in Coronation Park provide delightful alfresco areas from which to make forays into the delicious and aromatic food stall offerings. 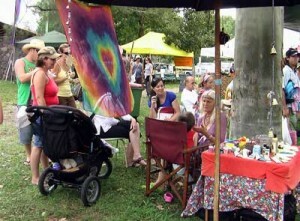 The Channon Craft Market’s reputation, not only as the longest running in the region, but as the most colorful and vibrant market in Australia really is cause for us to celebrate.